Lightweight key chain features Psalm 46:10, Be still, and know that I am God and hangs from a decorative bead chain from the sturdy split keyring. The keyring also includes a silver-toned dangle cross. The back has the outline of a lily pad flower and references the Bible verse. Coated for scratch resistance. 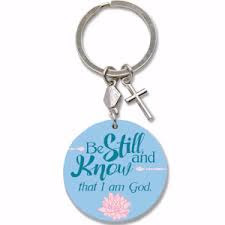 A daily reminder to Christian women, young and old, to be still and know! Key chain measures 3.7cm (1½") in diameter and is 8.2cm (3¼") long.